Ernie Barnes claimed that he was one of the most popular artists in the world. Indeed his depiction of the African American experience is unique and his vivid imagination is reflected in his artwork. Ernie was born in 1938 and began painting while playing college football at North Carolina College. He went on to play for five years in the NFL, then decided to call it quits and paint full-time. Many people recognize his painting called “Sugar Shack” from the classic TV sitcom Good Times. Most of Ernie Barnes’ artwork reflect his view of African American lifestyles but he also shows us his continued love for sports. He also has a commitment towards racial and ethnic harmony and many of his paintings reflect it. With all things considered it’s easy to see why Ernie is one of the most collected African American artists in the world. In 1966 Ernie Barnes retired from football to commit himself to his art. His athletic career made a special contribution to his sensibility and his art, and he often weds physical with artistic expression. Many of his subjects are satirical and he uses exaggeration, and even caricature, to enhance their mood, humor and physical vitality. Seen through Barnes’ dramatic-comic vision, human figures play out their roles in a contemporary scenario in a manner that is both entertaining and finely executed. It can easily be said that Barnes has more than established himself as one among America’s leading contemporary painters. – Debut solo exhibition, “Football In Action,” Grand Central Art Galleries, Manhattan, New York – hosted by Sonny Werblin, owner of the New York Jets. – Solo exhibition, “The Sports Art of Ernie Barnes,” McKenzie Gallery, Los Angeles – hosted by Tom Harmon. – Solo exhibition, the McKenzie Gallery, Los Angeles – hosted by Charlton Heston. – Solo exhibition, the McKenzie Gallery, Los Angeles – hosted by Adela Rogers St. John. – Solo exhibition, the Agra Gallery, Washington, D.C. – hosted by Congressmen Jack Kemp and John Conyers. – Solo exhibition, Elizabeth City State University, North Carolina. – Solo exhibition, North Carolina University Art Museum, Durham. – Solo exhibition, Heritage Gallery, Los Angeles. – Solo exhibition, North Carolina Museum of Art, Raleigh – hosted by Governor James Hunt. – Solo exhibition, “Athlete As An Artist,” Spectrum Fine Art Gallery, New York. – Solo exhibition, “Ten Who Remember,” Seagram’s, New York – hosted by Edgar Bronfman. – Solo exhibition, North Carolina Art Society Collectors Gallery. – Appointed official sports artist for the Los Angeles Olympic Summer Games. Commissioned by L.A. Olympic Organizing Committee to create five original paintings and act as spokesman for the Games, encouraging inner-city youth. – Solo exhibition, “Victor’s Crown”: Heritage Gallery, Los Angeles, and the Calvert Collection, Washington, D.C. – hosted by Congressman Jack Kemp. – Painting, “Fastbreak,” commissioned of the championship Los Angeles Lakers basketball team. – Mural, “The Metamorphosis of Rocky,” commissioned by Sylvester Stallone. – Painting, “Growth Through Limits,” featured as an inspirational billboard, Los Angeles. – Mural, “Meeting the Challenge,” commissioned for Seton Hall University, New Jersey. – Mural, “A Dream Confirmed,” commissioned for St. Benedict’s Prep School, Newark, New Jersey. – Painting, “Victory in Overtime,” commissioned by owner Jerry Richardson for the Carolina Panthers football team. – Painting, “The Dream Unfolds,” commissioned by the National Basketball Association in commemoration of their 50th anniversary. The original painting hangs in the Naismith Memorial Basketball Hall of Fame in Springfield, Mass. – Major commissions included a portrait of actor Will Smith with his sons. 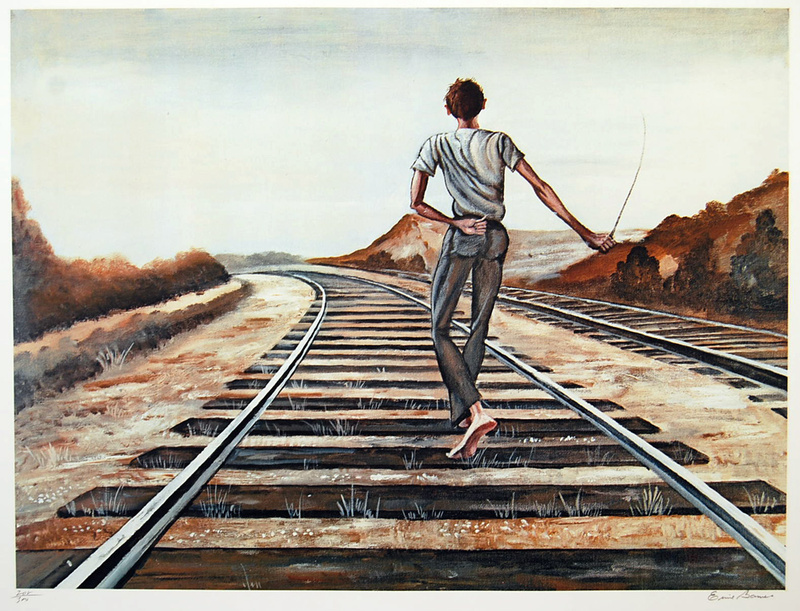 – Painting, “The Advocate,” was donated to the North Carolina Central University School of Law. – The release of six Motivational Sports Posters. – Series of Motivational Sports Posters contracted by Blue Mountain online greeting cards. – Seattle Art Museum: Formal unveiling of painting, “In Remembrance,” a visual response to the Sept. 11 events. – Major commissions included a portrait, “Oscar the Champion,” of boxer Oscar De La Hoya. – Painting, “In Remembrance,” acquired by Philadelphia Park owner Robert Green on behalf of the City of Philadelphia.